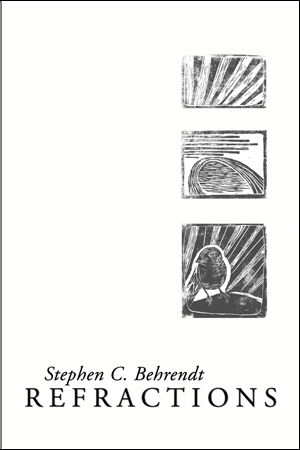 Refractions is the newest book of poetry from noted writer & scholar Stephen C. Behrendt. It was released in September 2014. 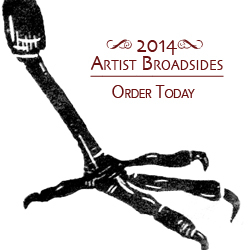 This five part collection includes original woodcut prints from artist, Rebekah Wilkins-Pepiton. “These poems are very accessible examples of contemporary Americana, engaging a tradition of American Romanticism descendent from Wordsworth and Emerson. These poems are fully grounded in an everyday life that is invested with significance through the poet’s feelings and perceptions, and they contribute significantly to a growing body of early twenty-first-century war poetry. The word “refractions” then becomes a trope for our different engagements with everyday life and the variety of effects that it has upon us. Rebekah Wilkins-Pepiton’s black and white primitivist woodcuts represent images of the landscape, birds, or plant life described in Behrendt’s poetry. As is usual for collections of poetry by Shechem Press, the book is beautifully bound and typeset, and is worth the time of an afternoon’s reading or of further critical engagement.” –Dr. James Rovira, Associate Professor of English at Tiffin University, in Rhizomatic Ideas. Stephen C. Behrendt is a native of northeastern Wisconsin who lives now in Lincoln, Nebraska, with his wife Patricia and their daughters Maia and Mei Grace, and an assortment of rescued dogs and cats. He is George Holmes Distinguished Professor of English at the University of Nebraska. An international authority on British Romantic literature and culture, he is also a widely published poet. Refractions is his fourth collection of poetry.